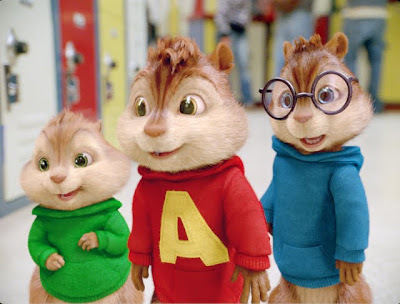 Public squeaking may not scare Alvin, Simon and Theodore as the world famous singing sensations The Chipmunks but when it comes to high school and especially bullies who have a penchant for swirlies, Dave's three “boys” are so petrified that they're ready to call the humane society rather than return on day two. Unfortunately, their temporary guardian – a grown man who refers to himself as “The Tobester” (Chuck's lovable Zachary Levi) -- is under strict orders from both the Parisian hospital-bound Dave (Jason Lee) and the boy's popcorn gifting elderly aunt he accidentally put into the hospital as well, to follow orders in ensuring they have a normal adolescence. 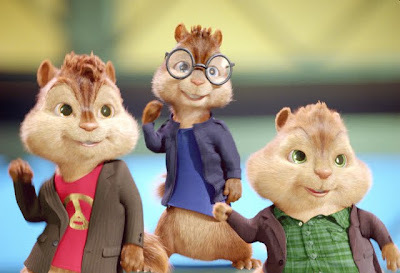 Yet, when the three stand up for themselves and get in trouble for fighting jocks at West Eastman High, their closeted Chip-groupie principal forgoes suspension in favor of requesting that Alvin and his brothers will perform at a school contest to help save their Eagle classmate's music education program. With Alvin adhering to the “if you can't beat 'em, join 'em,” approach by becoming the football team's Most Valuable Player, it's left to Simon and an increasingly alienated Theodore to not only try to maintain some semblance of normalcy but also prep for the competition. Never one to have doubts about his talents, Alvin's attitude implies that he believes it's in-the-bag. 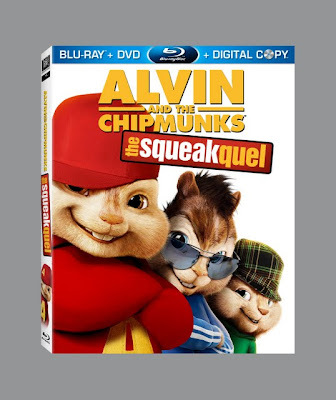 Yet when their old unscrupulous manager Ian Hawke (David Cross) swoops in with three cute musically gifted girls dubbed The Chipettes who enroll in the exact same high school, all bets are off as the two groups -- evenly matched right down to color and personality -- square off for the championship. With Jason Lee benched for a majority of the sequel aside from brief bookend appearances, the task falls to a surprisingly natural Levi to fill in which he does with gusto, proving to have a natural ability to play an extreme slacker version of the live-at-home, video game fan Chuck, by acting opposite air that will later be filled in with the CG musical animals. Learning only after the fact that female comediennes Christina Applegate, Amy Poehler, and Anna Faris were the ones lending their voices to the roles of Brittany, Eleanor and Jeanette Chipette since the original rhythms of their speech are disguised by the trademark fast-forward sounding squeak, the film also benefits from additional girl power as blockbuster director Betty Thomas takes over the reins of the franchise. Still it has little in common with the original characters created back in 1958, save for a blink-and-you'll-miss-it homage to the date by making the numbers the street address where the the three live. 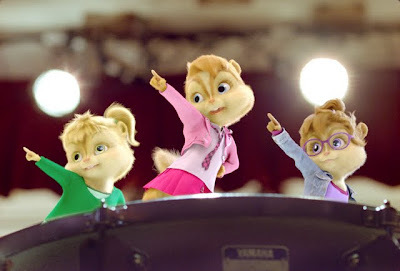 Nonetheless, the sequel remains a superior effort by comparison with the prequel since it keeps its scope narrower, its plot far more focused on relatable elements like school and friendship and also benefits from the appeal of not only Levi's charm but also the welcome introduction of '80s TV series favorites The Chipettes. Despite this, it's still a far cry from the far more original animated work coming out of Hollywood today and indeed from Alvin's home of Fox Studios via 2009's wonderful Ice Age: Dawn of the Dinosaurs and Fantastic Mr. Fox. And even though the bar was set fairly low by the first movie and this one has its shortcomings overall, it's ultimately a benign, lukewarm effort filled with sing-alongs, featurettes and a plethora of goodies especially in the eye-popping Blu-ray Combo Pack that boasts a DVD and Digital Copy as well so you can easily take the movie on the road with you for its young fans. Likewise, it should no doubt appeal to its target demographic and their parents thanks to a healthy blend of classic and contemporary musical selections like “You Really Got Me” and “Stayin' Alive,” along with “Put Your Records On,” “Hot N Cold,” and “Single Ladies (Put a Ring on It)” as well as the all-too familiar, universal terrain of high school bullies and cliques that will make you wish you were at the humane society.